First appearances in vaudeville and the circus, as a force acrobat. This is early 1882 and Abs' debut. This took place between 1882 and 1885. This is from American newspaper research. Initially it is reported to be expected on March 7, 1885. Then it is again expected on March 9, 1885. It is not reported as arrived in The Times until March 11, 1885 though, with a log date of today. First Cabin - $55, $65 and $75. Steerage - $10; round trip. They are said to be reduced prices. On March 17, 1885 it's reported two passengers from the ship have been diagnosed with "typhus" and "proper sanitary precautions" were being taken to stop it spreading. The whereabouts of all of the passengers is going to be ascertained too due to the disease being extremely infectious. It's said around 100 passengers were on the ship. On March 20 it's reported another has been found with "typhus." This time it says there were 100 immigrants on board. On March 22 it's reported the sixth person from the ship has been diagnosed with "typhus." In the same newspaper column a report from the Sanitary Bureau is printed which states 5 people have died from "typhus fever" over the past week. Referee: Joe Coburn "Veteran Prize Fighter"
This is billed as Abs's first appearance in America. A Kansas newspaper states $2 were for reserved seats and admission on the door was $1. No local paper mentioned that. It's said Hoeffler is one of John L. Sullivan's troupe of athletes. Hoeffler is said to be 5'10.5''. Abs is billed as the Germany Champion. "is a perfect specimen of manhood. He has an intelligent face, black curly hair, and the muscle of his neck and shoulders stand out like whipcords. Not withstanding his geat weight there was not a pound of superfluous flesh on his body." Abs is said to have defeated "Vauss, the famous German wrestler." Abs is also said to have a reputation as a weighlifter eprforming feats such as lfiting a 1,500lb horse with the use of a harness and raising a 230lb dumbbell with one hand. Said Abs may have a promising future and is likened to Clarence Whistler. Mr. Schmidt was announced as challenging the winner of the bout. Bibby said Schmidt will get a match then. Bibby continued to say Abs's backer was in attendance and would back any amount against anyone in the world at Graeco-Roman on behalf of Abs. Hoeffler claimed Abs had choked him and pointed to some "slight abrasions on his throat." Hoeffler said he would face Abs again though. Bibby said Abs will wrestle anyone for $1,000. Matsada Sorakichi then shouted, "That's me." Abs is reported as saying he is confident he can beat any man in the country at Graeco-Roman. Some out-of-town newspapers report "Experts pronounce Abs a second Clarence Whistler." An Hartford paper called him "the new sensation in New York." It's reported Matsada Sorakichi, the Japanese Champion, has challenged Charles Abs to a match in Japanese, Graeco-Roman and Catch-as-Catch-Can. Sorakichi wants the match to be three oout of five falls and to take place in New York on April 6, 1885. He proposes 65% of the gate receipts to the winner and 25% to the winner. Abs refused any style other than Graeco-Roman. The two wrestlers signed articles of agreement. Richard K. Fox as made the final stakeholder and was given a $100 forfeit by each man. Two thirds of the gate will go to the winner as well as $250 staked by each side. Joe Coburn, Prof. William Clark, James Pilkington, Wallace Ross, Captain James C. Daly and a host of others were present. Attendance: "Crowded" / "Every Seat Was Taken" / "Sanding Room Could Be Secured In The Hall" / "About 2,000" / "Over 2,000 Men"
Abs is billed as the German Champion. Sorakichi is billed as the Japanese Champion. Abs suffered a cut on his head when Sorakichi charged at him head first and their heads crashed together. It's said Abs "smiled when he saw his blood-stained garments." At one point in the match Sorakichi exclaimed, "Too muchee likee Jumbo," of Abs. Sorakichi managed to push Abs on top of the footlights while the German was off his guard. Then while Abs was off-balance Sorakichi shoved him again and sent Abs off of the stage and under a table. Again Abs is said to have smiled upon seeing the broken chair and crushed high hat which was a result of his fall. Police Captain McCullagh threatened to stop the match if Sorakichi didn't abide by the rules of wrestling. After 50 minutes wrestling Coburn allowed the men a 10 minute rest. When the men resumed Coburn was unhappy with Abs's workrate and threatened to give the purse to Matsada if Abs didn't get a fall in 10 minutes. Bibby spoke up and informed Coburn he could not do that as two falls were needed to win. A member of the audience shouted agreement with Bibby. Coburn threatened Abs again a few minutes later and was met with fans gesticulating wildly with their canes and hats to show their immense displeasure. One woman rushed the ring and made "warlike motions" at Coburn. She turned out to be Abs's wife. Captain McCullagh again sensed trouble and whispered something into the ear of Coburn. Coburn again accused Abs of not wrestling, but this time just called the match a draw. The spectators left "sadly disappointed." "About 2,000" for attendance comes from an out of state newspaper. "Over 2,000 Men" was reported in Buffalo. Papers from other cities also reported the match as being $500 a side, rather than $250 a side. An out of state paper reported that James Daly was second for Sorakichi. Attendance: "A Number of Gentlemen"
It is said Muldoon had been heard saying he could throw Abs five times in sixty minutes and would bet $500 on it. Severl members of the Racquet Club put up the purse. Muldoon said he'd make a match with Abs if he can defeat Matsada Sorakichi. It's reported Carl Abs and Matsada Sorakichi will wrestle on April 16. It's speculated William Muldoon and Carl Abs may meet at Madison Square Garden soon. It's reported Carl Abs and Matsada Sorakichi have posted their final deposits of $150 each. It's said there was "brisk betting" the day before the match at Hoffman House. Odds of $100 to $80 are that Abs will not last an hour. Betting was also on at the Carlton House. Al Smith wagered $500 to $400 on Sorakichi. Justin McCarthy wagered $500 even on Abs not being able to defeat Sorakichi. Abs is listed as the German Champion. Sorakichi is listed as the Japanese Champion. After the first fall an admirer of Abs's threw the wrestler a bouquet of flowers. Like in the first match Sorakichi was heard to exclaim, "too muchee like Jumbo." Sorakichi managed to tangle his foot in the ropes to save himself in the second fall. Abs's fans cried out, "Foul! Foul!" It looked as though a row was about to get started, but Sergt. Gallagher, of the 17th precinct, managed to quieten the situation. Sorakichi quit due to being too tired to continue in the second fall, he told his second, "me sick, me sick." It's said a match has been arranged between Edwin Bibby & Carl Abs on May 1, 1885 at Turn Hall. They were allowed to rest for 15 minutes after wrestling for sixty. After the second hour the men were allowed to rest again. The audience was growing tired of "uninteresting work." After the first fall they were allowed to rest again. Non-local papers reported Bibby laid down to give Abs the match after wrestling three hours. "Excellent music" will also be a feature of the performance. In advertisements it said Hoefler would be entering a wrestler to face Abs. Non-local papers say this is for the "World Championship" or the "American Championship." It had been announced Paddy Ryan, the pugilist, would be the referee, however, he stated he knew nothing of the rules of wrestling and could not perform such a role. On May 17, 1885 the betting was $100 to $80 on Muldoon. McMahon is listed as the champion in harness. Matsada Sorakichi occupied a box with his backer, John Conroy. Tom Gould, Ed Mallahan, Paddy Ryan, Billy Madden and Bob Smith were all in attendance too. It's said "innumerable gas jets made it hot." Muldoon made a speech on behalf of himself and Abs, who spoke no English, prior to the match. During part of his speech Muldoon asked the crowd not to smoke. When the match got underway Jerry/Jere Dunn and Wm. Harding sat in the count room and began counting the receipts. It's said Muldoon is Abs's biggest opponent thus far and Muldoon isn't big enough for the German! After an hours work the two men were allowed a rest of 15 minutes. After a further half hour they were allowed 2 minutes rest. Madden offered a wager of either $500 or $1,000 that McMahon could throw Abs at Catch-as-Catch-Can. Nobody took Madden up on the wager. Jere/Jerry Dunn is said to have stole a handful of money from the box office amounting up to $500. The crowd were unhappy with the contest ending in a draw. The challenge is for $250 a side. It's said Voss arrived from Havana on May 25. Voss injured his foot while performing feats of strength when a heavy weight landed on it. Due to the injury he could not wrestle Abs as scheduled. It's reported in the Daily Eagle that Carl Abs and Matsada Sorakichi will wrestle at Turn Hall on Monday. Menniger is said to have been the Irving Hall candidate for Alderman in the Sixth District in this city last fall. In Japanese rules if any portion of the body other than the feet touches the floor then the fall is over. Abs lost the second fall by using his hand for balance on the ground. In the third fall Abs got an arm-lock on Matsada and Matsada quit. He exclaimed, "You too muchee fightee." Sorakichi continued, while checking his arm was not too badly damaged, "You no likee a wrestler." After the match Mrs. Matsada Sorakichi had a verbal exchange with some men who called her husband a "quitter." Some papers speculated this was a "hippodrome affair." It's reported in The Inquirer that Joe Acton and Carl Abs will wrestle at Pastime Park within a month. $500 purse and Graeco-Roman style. Voss claimed to have malaria. This is from out of city newspapers. Attendance: 1,000+ / "Several Thousand"
It is said Acton had asked for a postponement of the match due to being ill several weeks prior to the event. Then as it got closer felt better and agreed to wrestle today. However, he did not show-up and it was explained there must have been an misunderstanding with Abs. Therefore it was postponed until July 6. Carl Abs leaves New York for Europe. It's noted as being in a "mysterious manner." This was printed on July 18 by the Police Gazette. Papers stated it appeared this was never meant to come off and the organizers of the event did not even turn up to the show. It's said Abs had gone home to Germany. It's said the promoters and arrangers of the event were not on site. This happened in late 1885. 1 - Carl Abs def. ??? Carl Abs leaves here for Turin, Italy. Abs perfomed as force acrobat. Attendance: "Despite the Unwonted Rivalry at Her Majesty's, the Usual Crowded and Noisy Boxing Night Audience Assembled"
By Herr Carl Abbs "The Strongest of All Strong Men"
This is billed as the debut of both the pantomine and Carl Abbs. Originally Abs is advertised to debut at the Covent Garden Grand Circus on December 26, 1889. He only appears in one advertisement for the Covent venue though and then he is added to the Drury Lane show about a week prior to the show. The one of the diretors of both Drury Lane and Covent Garden was Augustus Harris though, so it was simply a case of Harris needing Abs at this venue more. Colonel North; H.L.W. Lawson, M.P. ; Montagu Williams; Captain Shaw, fire brigade; W.H. Russell, Henry Petitt, G.A. Sala; Lord Londesborough and party; and Lady de Grey were all among the audience. At the Alhambra Theatre Herr [Eugen] Sandow is in his last few dates of a near month long engagement. Due to the detailed pricing arrangement I'll put it here. After this performance there is a special benefit performance in the afternoon. Abbs is not mentioned as a part of it. The pantomine continues until March 15, 1890, but Abbs is not advertised to appear again. Carl Abs made some appearances here. Abs made some appearances here. Cannon is said to have posed the champion wrestler of the world for several years. It's said with this victory Abs wishes to challenge Cannon fr the World Graeco-Roman Championship. This was reported in English & Irish newspapers. It is reported here that Carl Abs has gone to Berlin, Germany. They also say it's hopeful Abs and Tom Cannon will have another match. Cannon is being listed as the World Graeco-Roman Champion after beating 27 different wrestlers. This information is from British & USA papers. It's also reported in Britain that Cannn claimed to have slipped on the floor which was in a bad state. It's said 1,000 people came on a special train from Hamburg for the match. This is reported in British newspapers. It's stated the match will not be renewed. Prince Ernest of Schleswig-Holstein and other distinguished officers are in attendance. Cannon is said to have thrown Abs eight times, but never managed to touch Abs's shoulders to the floor. The contest will not be renewed. This is as per UK newspapers. They report that Tom Cannon has been banned from wrestling in Berlin as a consequence of this match. He apparently tried to break Stoerensen's neck during the contest. Took place during the winter, possibly 1894 though. It's reported in America a match between Ernest Roeber and & Carl Abs has been arranged. For 2,000 marks and the World Championship. Abs is listed as the German Champion in an American paper. Roeber is listed as the American Champion in an American paper. Partially from an account by Ernest Roeber told in a letter to American journalists. Roeber claimed Abs refused to wrestle to a finish. Roeber said before 5 minutes were up Abs was covered in blood. Roeber says a rematch has been agreed upon. The letter was wrote between October 6 & October 14, 1894. 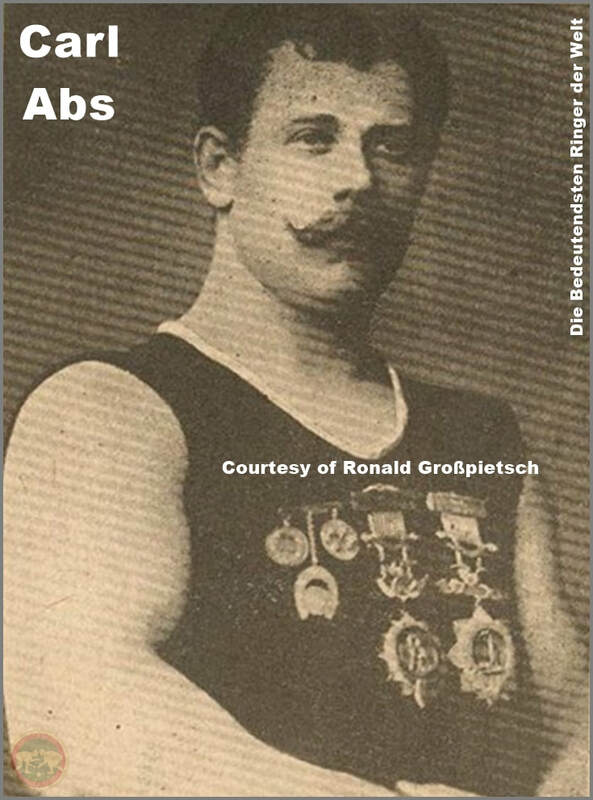 A German newspaper on September 23, 1894 stated that: Roeber drew Abs after fifteen minutes. Pohl had decided the match was over and Abs said he could not wrestle any longer because of a broken tooth. Abs left the stage. In a 1921 interview Robber said at the fourteen minute mark Abs, "ran out of the ring. I shouted after him to come back, but he refused. He said he had enough." Roeber challenged Abs for the World Champions, he made a challenge to John Pohl, Richard Nogat and Magnus Bech-Olsen. 1 - Two out of Three Falls - "Police Gazette Rules"
Carl Abs attended the match. Roeber challenged Abs again; Abs said he would wrestle against him during the next three weeks. Roeber's October 1894 letter stated he won two out of three falls, the times, and the rules used. Roeber also gave the attendance and said, "It was one of the hardest matches I have ever wrestled in Germany." Carl Abs and his protégé John Pohl traveled to eastern Europe; most of the matches were held by Pohl because of Abs's illness. Unique content strictly for the Professional Wrestling Historical Society. All research has been completed by the Professional Wrestling Historical Society or by a trusted contributor. Information came from contemporary newspapers unless otherwise stated.